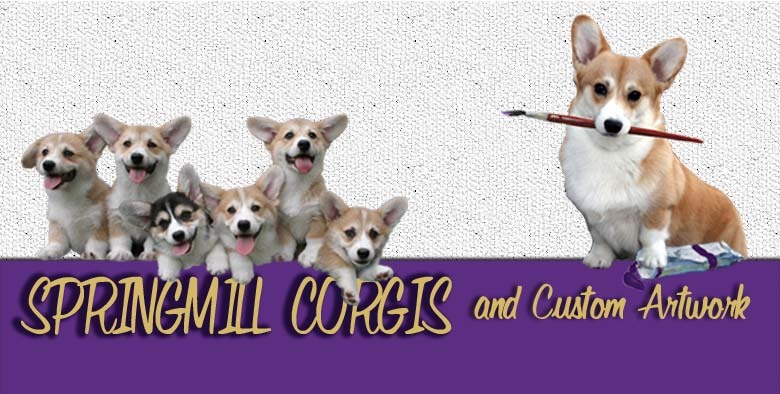 Springmill Corgis is a small kennel owned by Mike and Nancy Oehlhof dedicated to breeding, raising and training sound, happy, healthy Pembroke Welsh Corgis. It's located in Shelby, a small rural town in north central Ohio. Mike is a grain buyer at Sunrise Co-Op and manages the Crestline branch Grain Elevator and Nancy is an artist. (see Corgi Art Work) We have three grown children, Shelly, Nicole and Steve and eight grandchildren. 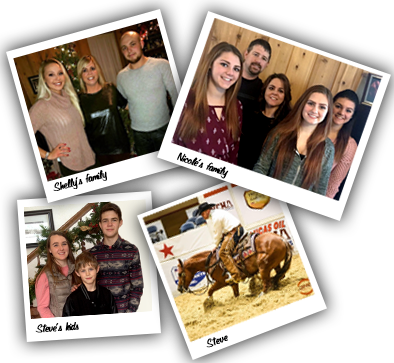 Shelly resides in Shelby and has two grown children, Logan and Reganne Vail. She is a nurse. Nicole is married to Benji Lynch and they also reside in Shelby. They have three daughters Mallary, Macy and Marissa. Nicole is a teacher at St. Mary's School in Shelby. Steve has three children, Lauren, Peyton, and Westen. He is a cutting horse trainer (see Steve Oehlhof Cutting Horses) working out of the Rock Creek Ranch in Weatherford, Texas. We were introduced to the wonderful world of Corgis while our children were showing horses. It was during that time we purchased our first corgi later to become Ch. Springmills Billy The Kid CD (see Rainbow Bridge). Billy became the first of many accomplishments for us. He was not only our first corgi he was our first Champion, our first Obedience Title, and the sire of our fist Homebred Champion. 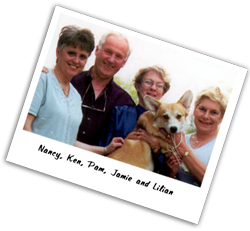 In 1993 we purchased Tillie from Gayle Garvin of Garvin Pembroke and Cardigan Welsh Corgis. Tillie, later to become Ch. Garvins Diamond Tiara. (see Rainbow Bridge) was the real beginning of our Show Ring successes. 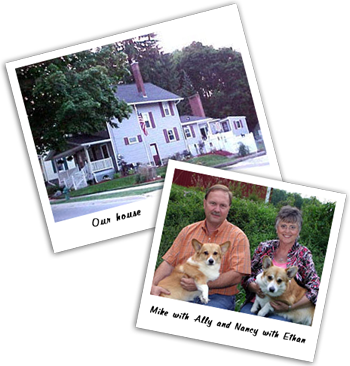 We purchased and showed several dogs from Gayle, who has helped us along the way. In 1999 along with Pam Hudson of Calloway PWC we imported Jamie from Ken and Lily Beazley of Cinonnie PWC in England. Jamie soon to become Am. and Can. Ch. Cinonnie Rigel (see Boys) has set the standard we strive for today. Since beginning showing and breeding in 1992 we have strived to produce quality corgis for companions and showing. Take a look around our site to meet some of our dogs. Several of the dogs pictured are either co-owned or have been retired to a special home of their own. We are active members of the Pembroke Welsh Corgi Club of America, the Ohio Valley PWC Club, and the Lakeshore PWC Club. Nancy and MIe have both serverd terms on the board of the PWCCA. Nancy is a past Newsletter Editor for the PWCCA and a past Chairman of the Newsletter Management Committee. We were the Show Chairman for the 2001 & 2009 PWCCA National Specialties. Mike is a past Presidents of the Ohio Valley Pembroke Welsh Corgi Club. Nancy is currently the President of the Ohio Valley PWC Club and the web master for the OV club's website.